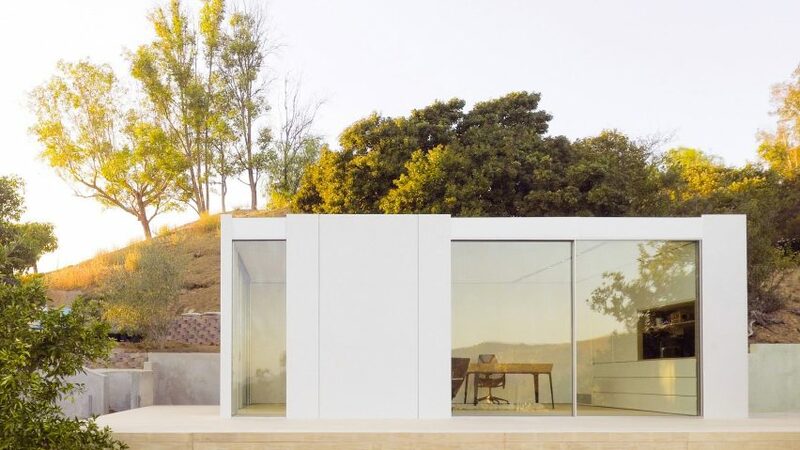 Design-build firm Cover, which uses computer algorithms to create customised backyard dwellings for homes, has completed its first project: a small studio in Los Angeles. The 320-square-foot (30-square-metre) prefabricated building is situated on a hillside in northern LA, and serves as an office and music studio for an Oscar-nominated sound editor. The white, rectangular structure consists of a steel framing and floor-to-ceiling glass. Inside, the building's single room is fitted with wooden flooring, contemporary decor and built-in storage. An air-tight building envelope and a radiant heating-and-cooling system help keep energy costs low. The unit, which took three months to design and build, was assembled in Cover's LA factory and then shipped to the site. The project cost $110,000 (£83,450), which included foundation work. It is the first completed unit by the company, which produces customised backyard homes often referred to as accessory dwellings — touted by some as a way to increase density and provide affordable housing in growing metro areas. Ranging from 100 to 1,200 square feet (nine to 111 square metres), the dwellings can be used to accommodate guests, in-laws or rent-paying tenants, or they can serve as studios, workshops, pool houses or lounges. "Cover sets out to make living and working in a thoughtfully designed and well-built space a reality for everyone," said the company, which was launched in 2014 and is backed by venture capital funding. The cofounders, Alexis Rivas and Jemuel Joseph, have architecture degrees and formerly worked at design studios. The company uses digital tools to streamline the design and construction process. Clients provide details – such as design preferences and site conditions – which are fed into a proprietary computer program that generates multiple design options. Within days, clients receive renderings and plans, along with a full quote. After the design is chosen, Cover obtains the necessary permits, installs the foundation, assembles the structure in its factory, and ships the components to the site. Assembly and installation take 12 weeks, according to the company. "Unlike other prefab companies and builders, Cover is a technology company first, armed with a team of full-time software engineers, designers, manufacturing engineers and architects who have developed technology that streamlines the entire process of designing, buying, permitting, manufacturing and assembling Cover units," said Rivas. The Cover dwellings are the latest in a series of projects that utilise generative design tools, which experts say could transform both the physical world and the role of the designer. The emerging technology uses algorithms to generate every possible permutation of a design solution.